at 1st base on Saturday. Walking to the #9 Mickey Merriam field on Saturday, the moments of joy from the last 3 games fill your mind. The task at hand seemed to be a tough one, as their challenger that day was the NE Seattle team. NESLL had outscored their first 2 opponents by a combined score of 17-2, while SLL had a 3 game scoring difference of 15-5. The tension was high throughout the game with lots of great plays on both sides. You could hear "Go play" and "Nice catch" from players, parents, coaches and umpires all game long. The final score was 1-0 in favor of the NES boys. This loss sent SLL into the 2nd chance bracket where a win on Sunday would put them into the championship on Monday. 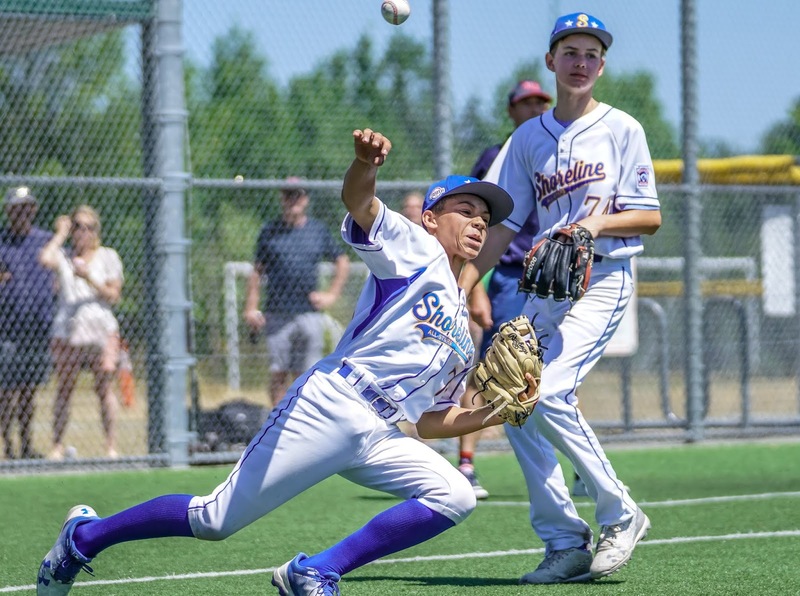 Sunday's game was against a Queen Anne LL team that earned their chance to play by winning their last 2 games in the 2nd chance bracket by beating Woodinville LL 2-1 on Friday and defeating North Central LL by a score of 3-0. 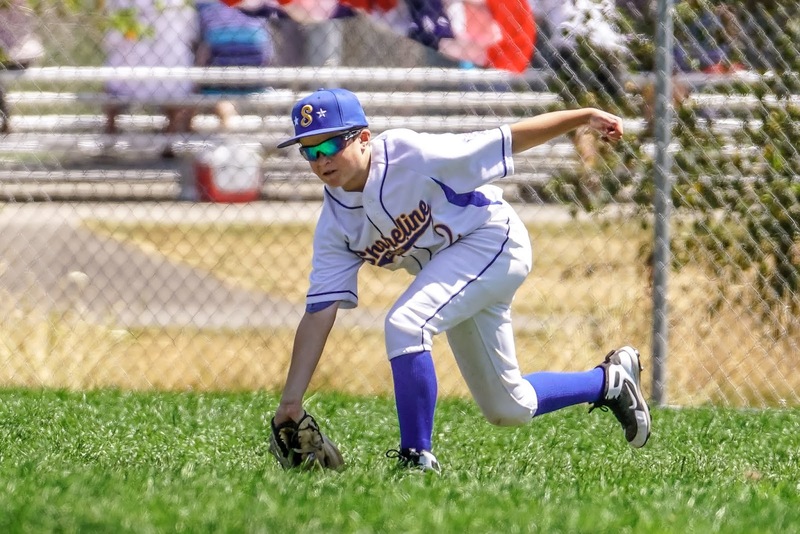 SLL Majors All-Star #2 Dillon Carrell reaches out to make an incredible catch in centerfield during Sunday's game. While listening to the comments by the crowd during the game, you got the sense that both teams were biting their nails with gripping anticipation before every pitch thrown. The combination of a quick lead by Queen Anne and an impressive performance by their starting pitcher, led to SLL playing from behind and trying everything they could do to get on-base. Both teams had to deal with a very questionable strike zone being called that day, but the QALL team overcame that obstacle much better than SLL. 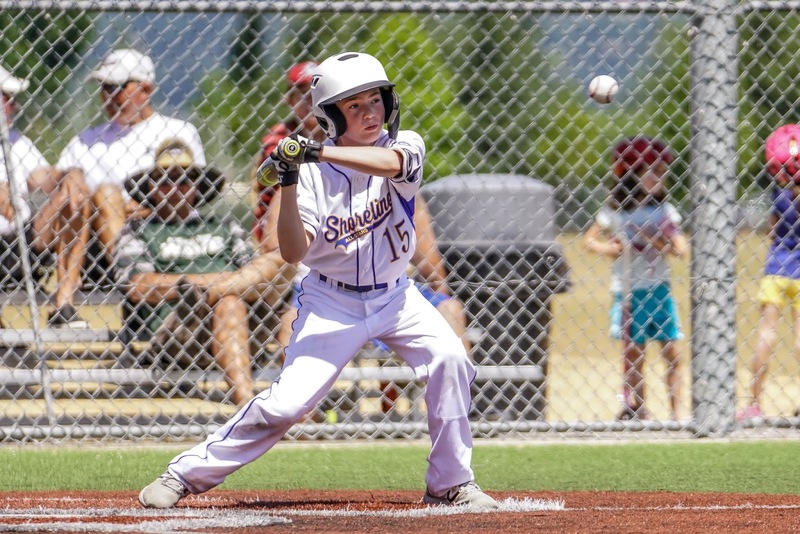 Normally mentioning the calls made by an umpire is thought to be a faux pas, because it is a very hard job to do and coaches will always tell their players to control what they do instead of worrying about what is out of their control, like umpire calls. However, during the course of this game you heard both sides questioning the strike calls being made against the other team. It wasn't them wondering about the calls being made on their team. But again, the QALL team did a great job playing through that situation and they earned the win. The game ended with an 8-1 score and SLL was eliminated in 3rd place. With 12 teams in the tourney, it was a good result that all of the other teams would have been grateful with. 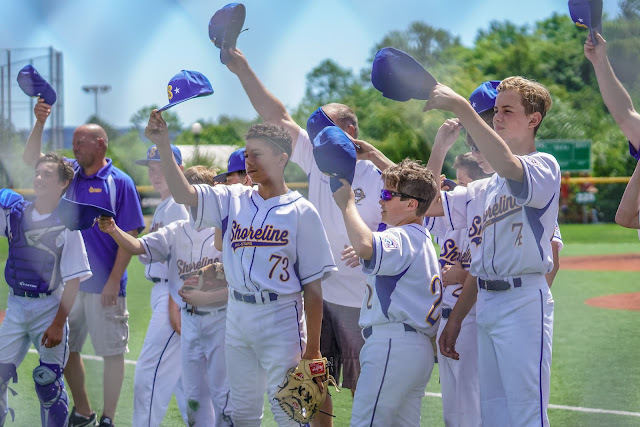 After the game ended on Sunday, the boys exchanged pins with the QALL players and then they received their District 8 All-Stars Tournament participation pins. As they left the field they wished luck to the QA boys in the championship game the next day. It was a well played tourney for this group of guys and I'm sure all of Shoreline will be wishing them all the best for their season next year. I believe you should have left out the "questionable" strike zone comments. As an umpire for youth sports, I know first hand what it is like to volunteer my time for the kids only to be berated by coaches and "fans". We are out there for YOUR kids, doing the best job we can, and all for nothing but the satisfaction of helping make your child's game fair for everyone. I read recently that upwards of 70% of new umpires/referees quit in the first year due to coach/parent belligerence. Of course we know kids like to be like their parents but teaching them it's OK to berate the official sends a very poor message. I was at the Majors' first loss game against NELL and heard a few Shoreline "fans" hammering on the umps. There were kids all around hearing it. Folks, we are not perfect volunteers. We do the best unbiased job we can, with the admittedly small amount of training we get. But just remember...we are out there in the heat, dust, rain, snow, and all other elements for YOUR CHILD! Just a modicum of respect is all we ask.